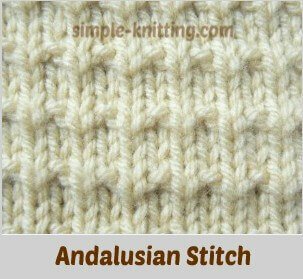 The Andalusian stitch pattern is very pretty and simple to knit. It creates a nice texture and is still simple enough to use instead of a plain Stockinette stitch pattern plus it spices things up a little. This stitch pattern is very simple to create with easy knit and purl stitches so it's a great pattern for beginning knitters. It's basically a Stockinette stitch pattern with one row of ribbing (knit one, purl one) that changes the look to a kind of grid pattern. You'll also find that it knits up pretty quickly because once you have worked the pattern a couple of times you'll have it memorized. This simple stitch pattern will look lovely on practically anything. Instead of knitting a sweater in Stockinette stitch give this stitch pattern a try. You'll be so surprised at the difference a simple stitch pattern can do. Or use it in your next mittens pattern or hats, socks and well just about anything. It just adds that little bit of eye candy. Have any ideas? Give them a try. Repeat rows 1 - 4 for pattern stitch. It's a pretty stitch pattern isn't it? Since there are a few pattern variations I decided to whip up another swatch with this version as well. You may like to try this one too. It's just as pretty as the first one and is called the Double Andalusian. This knitting stitch pattern is still really simple to knit up as well and it's also very pretty. Try making a scarf with it or anything you like. It is really simple and will perk up any plain knitting that you are working on. Row 4: Purl 1, *Knit 2, purl 1* repeat from * to * to the end of row. Would you like to try an easy knitting pattern to practice with? Great! 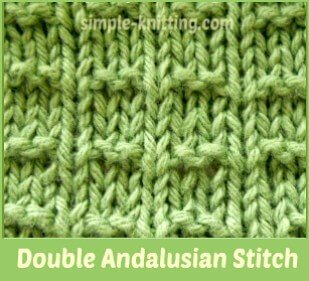 This pattern uses the Double Andalusian stitch. 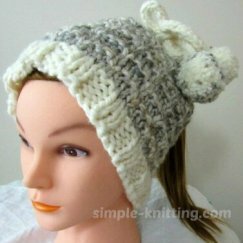 I made this fun knitting ponytail hat pattern. And the nice thing is it's not only a messy bun hat, it's also a knitted hat. It's quick to knit too so you can have it done in one or two evenings. Hope you like it.